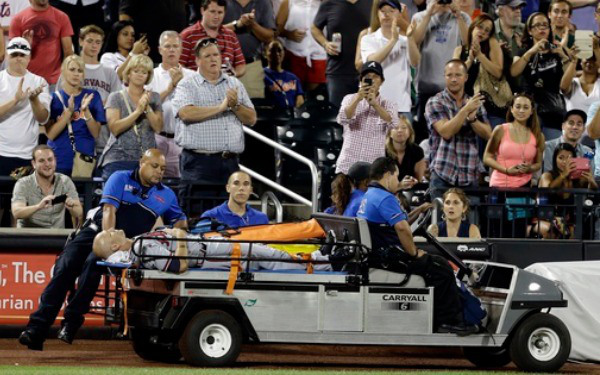 Atlanta Braves right-hander Tim Hudson was carted off the field after being stepped on by New York Mets outfielder Eric Young Jr. accidentally stepped on his right ankle/foot at first base. Young stepped on the back of Hudson’s ankle near his Achilles attempting to beat the throw by Braves first baseman Freddie Freeman. Hudson took Freeman’s toss at the bag just before Young arrived. Young immediately went over to Hudson to see if he was ok.
Hudson , 38, stayed down in obvious pain before being carted off by medical staff. Hudson had gone 7-7 with a 4.08 ERA and 1.21 WHIP in 123 2/3 innings. He held the Mets to two runs on four hits in 7 2/3 innings before the injury.